Lt. Jamie Ralston (left) represented the Marion Police Department at the graduation ceremony of Officer Dylan Kelley (right). 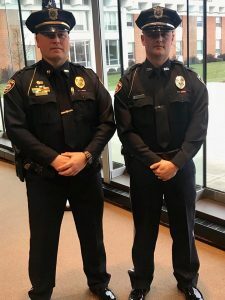 Members of the 140th Basic Peace Officer Class, including one from Marion, received training certificates during a graduation ceremony held Friday, November 16, 2018 at the Ohio State Highway Patrol Training Academy. The 12 graduates will assume duties as peace officers for 10 Ohio agencies. The following is a list of graduates and their agencies.